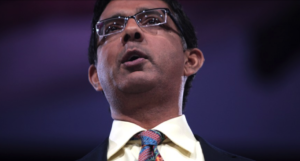 My wife Tanja and I had the honor of meeting and getting to hear from one of my idols, Dinesh D’Souza, at a dinner function a few weeks ago. Dinesh is an immigrant from Mumbai, India (formerly Bombay), and has had a very interesting career here in the United States where he has been a citizen for more than 27 years. Dinesh D’Souza, a prolific author, speaker, and filmmaker, shook things up in Reno last month. He has served in Ronald Reagan’s administration, written 20 books, and produced four movies with a fifth in the works. If you are on the left side of the political aisle, you are probably not a fan of Dinesh. I think all of you know where I stand in my thinking. However, regardless of how you think, the guy is undeniably compelling to listen to! The books I have read and the movies I have seen by Dinesh are thought-provoking to say the least. They can be shocking because he doesn’t try to sugar-coat his “politically incorrect” views or his presentation of them. His writing and speaking style reminds me of a modern Ayn Rand. If you want to have some fun, search on YouTube for Ayn Rand on the Phil Donahue show. She is so blunt and to the point. It is fun to watch Phil Donahue try to stump her with questions. Watching Rand on that show took me back to a more respectful time in our nation when we could — at least occasionally — have a reasonable civil discussion. Like Rand, Dinesh is wicked smart and a very eloquent speaker. How I wish I had that gift to be able to express my thoughts the way they do. What I absolutely love about Dinesh’s story is that he immigrated to this great country of ours and lives the American dream. None of it has come easy. If you look him up to learn more, you’ll see that he is lambasted by the left, so prepare to sift through a bunch of media — the real, the fake, and the opinion. Regardless of your left-to-right position on the political scale, if you can set your opinion aside for just a moment and truly listen, you’ll find that Dinesh makes you think. And that is how we get smarter and become better as a nation. Never are we made better by stopping free speech, no matter how much we disagree with what is being said. When that happens, it is called Communism.